When I was younger I never liked Earl Grey tea. Couldn't stand the stuff, even up to a year or so ago I just didn't like the smell of it even, let alone the taste. It was all about the added bergamot orange oil extract added to the black tea that made me shy away from the flavour. Now for some reason, if only that our taste buds change and we should now and then try things that we previously didn't like, I can't have enough of the stuff. I have a box of Earl Grey in my drawer at work amongst the Kenyan tea, Chai tea, and cafetiere coffee, and I have a box at home on the go amongst the other teas here. The reason I'm babbling on about Earl Grey is that this Yeastie Boys Gunnamatta had Earl Grey tea added during the brewing. At 6.5% volume this golden ale had a very punchy citrus smell on opening. As a matter of fact I'd dropped the can a few minutes before not concentrating, and expected it to explode all over the place. I opened it over the sink in the bathroom and there was a pleasant fizz, a little excitable foam, but no spillage. There's hardly anything worse than lost beer! Funnily enough I didn't like beer until I was in my late teens… er… eighteen! Yes, eighteen years old! Anyway, on taste the bergamot from the Earl Grey immediately sprang to the fore pushing aside the malted barley and slapping my tastebuds with its presence. There was also some citrus hops in the background trying but failing to push past it. 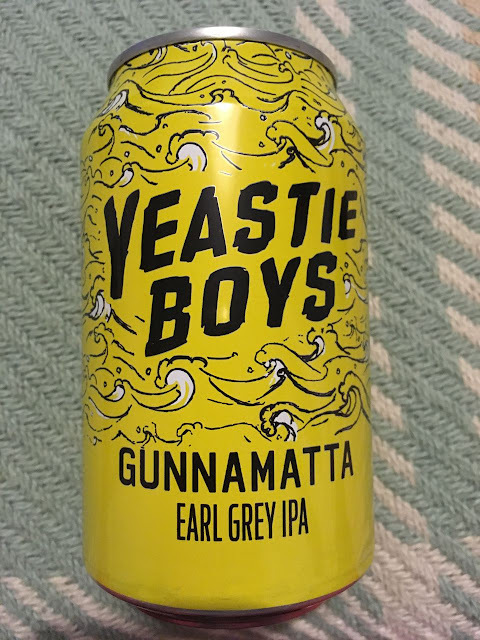 Even though there was some separation of the bergamot, I could really pick the Earl Grey tea from the other citrus hop flavours and sweetness of the malts. There was the malted barley, then the bergamot, some further bitterness from the citrus hops, and then there was the black tea right behind it all moving into the aftertaste mixed with sweet malt. This was quite an inventive combination of rich flavours in a small can of perfectly crafted beer.